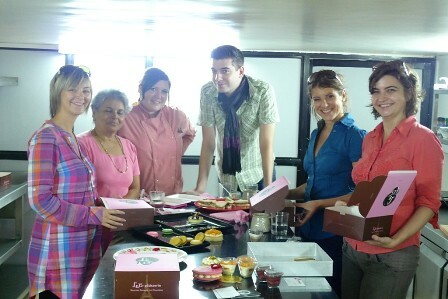 Le 15 Patisserie: Club France Bombay at Le 15! Club France Bombay at Le 15! 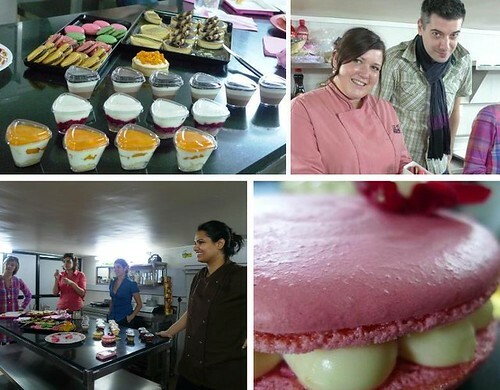 Just the other day we were lucky to have the Club France de Bombay visit our kitchen. We laid out a dessert buffet - Mon Amour, French Kiss, Summer Love and my favourite Paris Dream - the macaroon cake filled with raspberries and lychees, amongst other good things. (Check our menu!) Marie cooked up some ratatouille tarts as well as a mushroom and creamy caralemised onion sandwich - which is to die for, if I may add. The Frech Club is a 250 member strong, close knit community in Bombay and they keep meeting regularly for events and fuctions. The tasting at Le 15, was one such event where some of them came together to meet, greet and exchange casual banter. When you have the French around, the conversation is bound to be centred around food and everyone's favourite places to eat at. Of course, Marie was more than happy to be yapping away in French with the folks from the club. (She's such an entertainer, too bad tomorrow is going to be her last French cooking class). All of them really enjoyed the pastries they tired here and they were really impressed with the quality and variety of desserts. In fact, our tart citron passed Guillaume's test - which happens to be his favourte dessert! Update: Here is where they've blogged about us! je voudrais une tarte au citron tous les matins pour le petit déjeuner!!!!! !